Are you going to Milwaukee? As all HOG members know, not only will Harley Davidson be celebrating its 105th this month… but we will all be celebrating HOG’s 25th anniversary! A quarter century of Club HOG! If you are going to Milwaukee I imagine you will ride there. And then you will probably party for several days straight before riding that long journey back home. 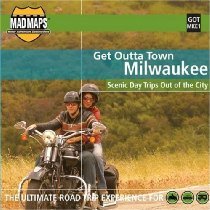 If you do decide to explore the Milwaukee area this map may come in handy. Click here for more information on this handy Milwaukee map from MADMAPS. Click here for more info about HD 105th and Club HOG 25th anniversary celebrations.